In this Robert Frost couplet, “The Secret Sits,” the poet may not have intended to speak of mathematics but his lines sing true for mathematical discovery. Nonsense verse has a prominent place in the poetry that mathematicians enjoy. Perhaps this is so because mathematical discovery itself has a playful aspect--playing, as it were, with non-sense in an effort to tease the sense out of it. Lewis Carroll, author of both mathematics and literature, often has his characters offer speeches that are a clever mix of sense and nonsense. For example, we have these two stanzas from "Fit the Fifth" of The Hunting of the Snark, the words of the Butcher, explaining to the Beaver why 2 + 1 = 3. 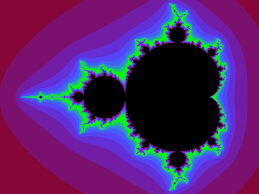 More familiar than the name Benoit Mandelbrot are images, like the one to the left, of the fractal that bears his name. Born in Poland (1924) and educated in France, Mandelbrot moved to the US in 1958 to join the research staff at IBM. A fractal is a rough or fragmented geometric shape that can be split into parts, each of which is a reduced-size copy of the whole, a property called self-similarity. Mathematics is a visual language. As with poetry, placement on the page is a key ingredient of meaning. Here is one of my favorite visual poems, "The Transcendence of Euler's Formula," by Neil Hennessey, a Canadian poet and computer scientist. For additional math-poetry from Neil, follow the link. Margaret Cavendish (1623-73) was a writer who published under her own name at a time when most women published anonymously. Her writing addressed a number of topics, including gender equity and scientific method. In my own library this next poem is found (untitled) in Collected Sonnets by Edna St Vincent Millay (1892-1950), but it also is found online at various sites. The first line of the sonnet, which announces Euclid as its subject, is well-known to most mathematicians; enjoy here all fourteeen lines.